INVITATION OF PRO-WILDERS SPEAKER AT LEEDS UNIVERSITY CANCELED BY SPINELESS JEWISH STUDENT SOCIETY…….. – The Tundra Tabloids……. INVITATION OF PRO-WILDERS SPEAKER AT LEEDS UNIVERSITY CANCELED BY SPINELESS JEWISH STUDENT SOCIETY……..
Islamization is death by a thousand razor cuts. 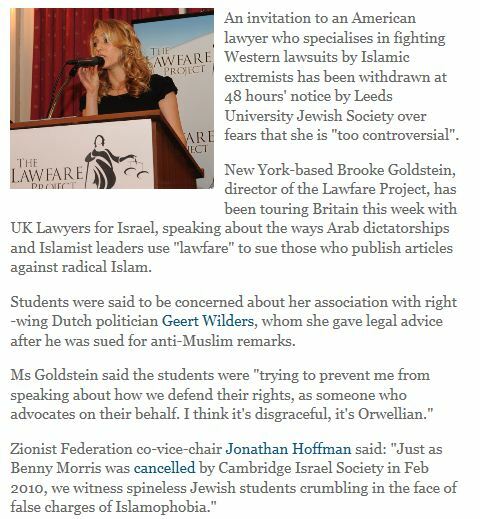 The feckless Leeds University Jewish Society dunderheads just handed a major win to the very people who seek their eventual dhimmitude. Not very smart. Previous Post Previous Post MUSIC AND ISLAM, ONLY IF ALLAH GETS TOP BILLING……..